Flynn Rider Wanted, a photo by ashleyludwig on Flickr. This hand drawn poster was first “enlarged” — hand copied into 4 quadrants on 8 1/2 x 11 paper. Once the pencil rending is complete, time to redraw an impression over your poster board! The lines, not shading, will serve as your guides for final sharpie rendition. Make sure to capture hair highlights, and ears… I almost forgot his ears. Finally, use a poster marker to fill in the dark coat, eyebrows, beard, and hair. He’s so terribly handsome… don’t we all fall for the bad boy…? Anyway, the little ones will have a blast smacking Flynn with paper frying pans. Voila! 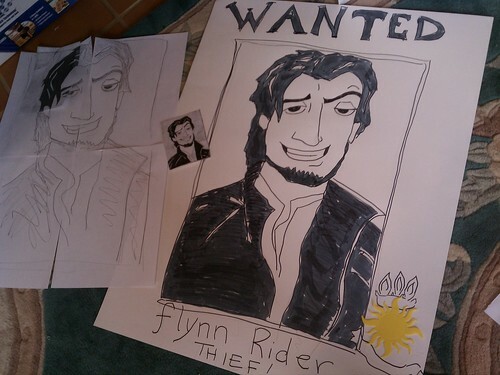 If you need help, or would like a hand drawn Flynn Poster, just come visit me in my Etsy store, or shoot me an e-mail. Takes about 5-7 days to complete & arrive. Super Mom Moments has the best printable frying pan, available for free on her site. She rocks.